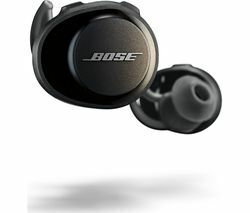 Bose headphones are precisely engineered to offer the most immersive and involving musical experience you can imagine. Thanks to advanced features like acoustic noise cancelling technology and exceptional build quality Bose headphones deliver a faultless listening experience that will thrill audiophiles and casual music lovers alike. Bose noise cancelling headphones including the top of the range QuietComfort 25 over-ear headphones and the in-ear 20i Quiet Comfort earphones allow you to lose yourself in your music like never before by giving you the option to mute distracting external sounds and focus on the rich, detailed sound these advances Bose headphones deliver. TriPort technology enhances sound quality still further, bringing out the finest details of your favourite music and heightening its dynamics and drama. 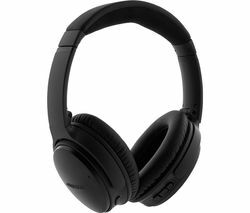 The Currys range also includes relatively cheap Bose headphones like the SoundTrue in-ear headphones, which deliver the stunning Bose sound at an affordable price. These light, comfortable earphones are designed to offer the ultimate on the go experience and fit securely and comfortable thanks to soft StayHear silicone eartips that conform to the shape of your ear and stay securely in place so that you can focus on listening. Look no further than Bose headphones for exquisite build quality and impeccable sound.